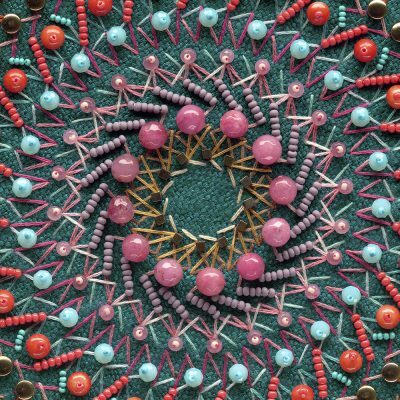 "The Universe Provides", detail, silk hand embroidered and beaded with semiprecious stone, crystal, and glass beads, 7 x 7 inches, 2018. 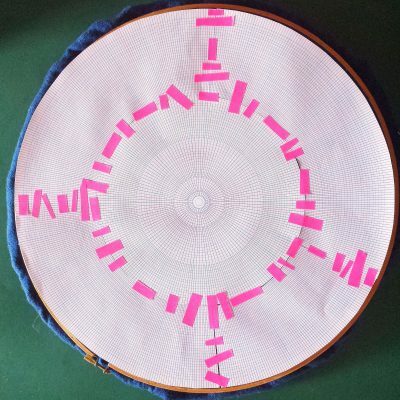 The mandala project is a hybrid fine craft and digital process iteration of the utopian, contemplative labor ideas that underpin the Happy Sleepy collaboration. 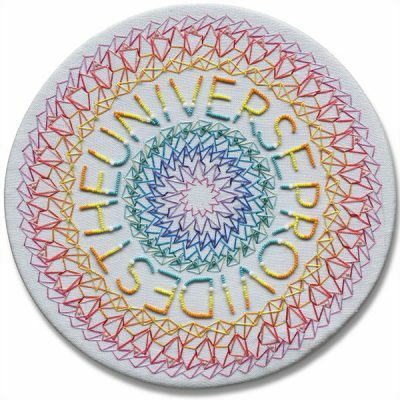 The phrases “The Universe Provides” and “Reabsorbed by the Universe” are beaded within the embroidery, turning the mandalas into linguistic as well as visual meditations on the bounty and balance of the universe. We all need reminders of the bigger truths that underpin our daily effort because the odds can seem stacked against us sometimes and the effort can feel futile. 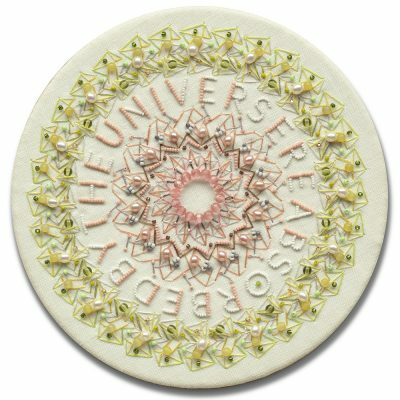 The text on the mandalas are personal sayings that help to integrate the paradox of our lives: we must foster an optimistic attitude while we also need to accept great change and loss. 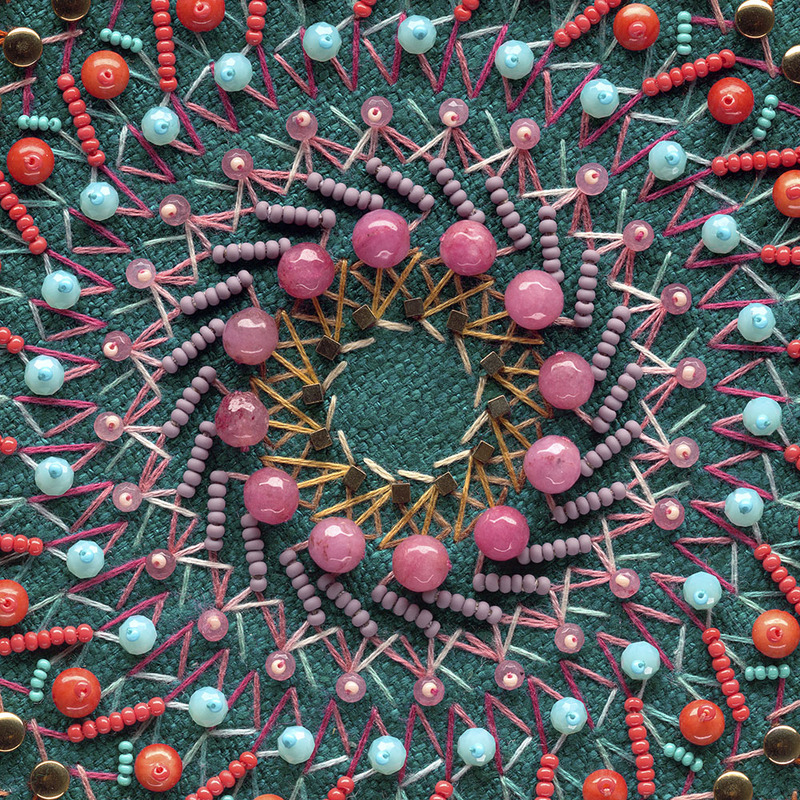 See all finished work in the Mandala Gallery. Fine craft making as contemplation and creative labour as social and political action are part of many indigenous and traditional cultures. 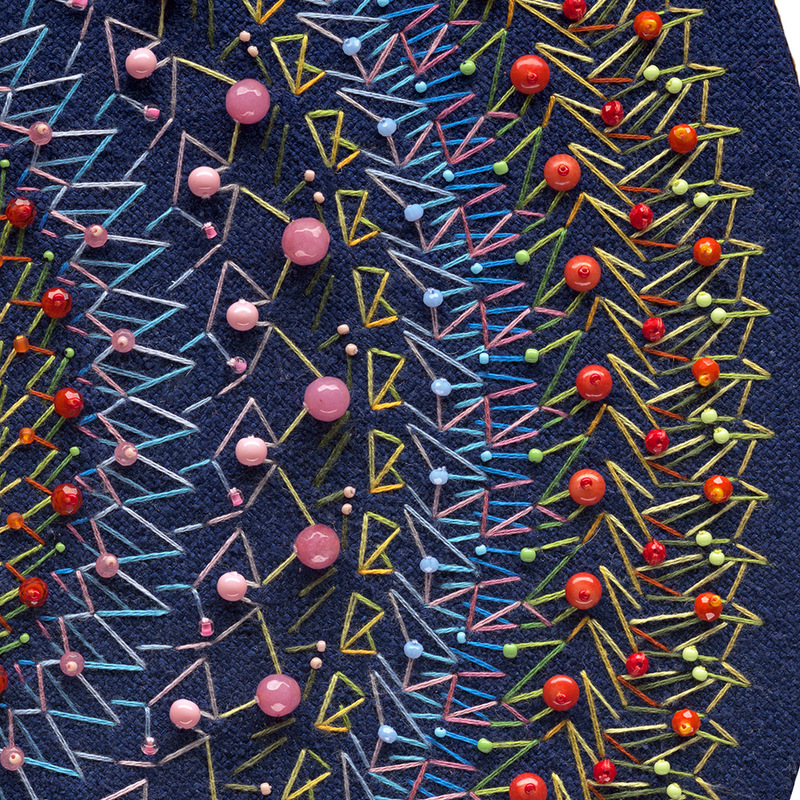 I (Magda) use the slow process of fine craft, such as embroidery and beadwork, as self-healing. Mandalas, themselves symbols of the universe, give form to ideas of providence and balance. Kaleidoscope photography are the finger exercises of this project. This section brings together the fast digital photographic experiments that are a counterpoint to the slow manual embroidery. This section collects photos and descriptions from the meticulous process from start to finish. Each embroidered mandala starts as several layers of supporting linen and the top, fine fabric that will receive the stitches. Next, a digital pattern is added to guide the stitches, and then the laborious process starts in earnest. 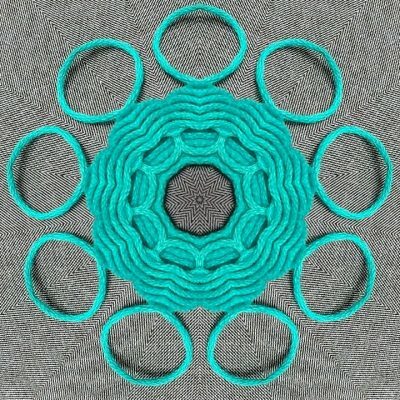 Instagram feed focusing on the mandalas.